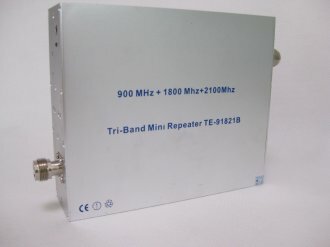 The Repeater -GSM850 MHz&1800Mhz&3G(UMTS)2100Mhz Tri-Band Signal repeater kit Works in all countries and covers GSM850/1800 /3G(UMTS)2100Mhz networks .its includes everything you need to improve cellular reception of voice and data inside your home or office. 1)Covers 300 to 500 square Meter. 2)Improves all Cellular 850 MHz/1800Mhz/2100Mhz sub bands. 3)Completely wireless - no need to connect to your phone to improvereception. 4)Easy to install and simple to use. 2）Full duplex and double-end design, external power supply, and convenient installation. 3）ALC technology with auto-steady function adopted. 4）Provide power indication and uplink and downlink indications. 5）With the amplified linear power, the intermodulation and spuriousness are suppressed effectively. 6）The reliability conforms to GB6993-86 standards.